Toilevator toilet base riser adds 3.5 inches in height to existing toilet, available for standard and elongated toilets. Platform Size: Standard Platform 22" Grande Platform 28"
The Toilevator™ with a patented award winning design is the leading toilet base riser that adds 3.5 inches in height to your existing toilet. 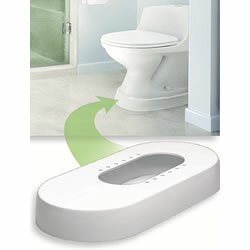 The Toilevator is a clean & safe alternative to standard raised toilet seats. The user sits on an actual toilet seat. The Toilevator is discreet & durable, fits under existing toilet base. The Toilevator® can be used on most round or elongated toilets.